The 67th Venice International Film Festival, organized by La Biennale di Venezia, will run 1st to 11th September 2010 at Venice Lido. The aim of the Festival is to raise awareness and promote all the various aspects of international cinema in all its forms: as art, entertainment and as an industry, in a spirit of freedom and tolerance. The Festival includes retrospectives and homages to major figures as a contribution towards raising awareness of the history of cinema. Marco Müller is the Director of the 67th edition. He has been heading the Venice Biennale’s Cinema section since 2004. 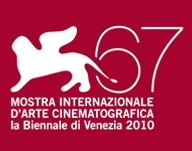 The official line-up of the 67th Festival includes the following sections: Venezia 67 – Out of Competition – Orizzonti – Controcampo Italiano Italian Comedy – The State of Things (retrospective section) The independent and parallel sections include: International Critics’ Week / Giornate degli Autori-Venice Days. The screenings schedule includes 11 days, from Wednesday 1st to Saturday 11th September. The pre-opening of the Festival will take place on 31st August at 8:30 p.m. (Arena di Campo San Polo, Venice) with the screening of Profumo di donna (1974) by Dino Risi. 4 International Juries will assign the official awards.